Increase your NP Gauge by 20%. 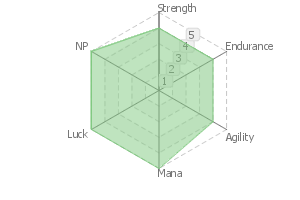 Increases party's Buster performance by 15% while he is on the field. 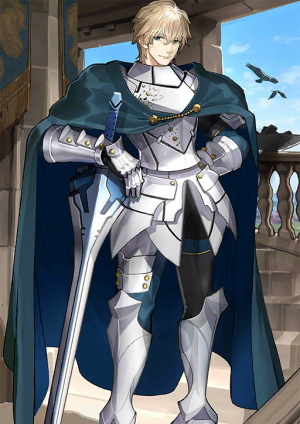 One of the Knights of the Round Table from the Legend of King Arthur. He is one of the oldest and most loyal knights serving under the King, staying with her until the very end. He wields the holy sword of the sun, said to be the sister sword of Excalibur. And thanks to the blessings of a saint, he won fame as a peerless knight who was unmatched under the light of the sun. No matter what the job is, he handles it earnestly. Even if it was something minor like collecting debts. The Revolving Sword of Victory. Similar to the king's sacred sword Excalibur, this sister sword was also brought by the fairy "Lady of the Lake". 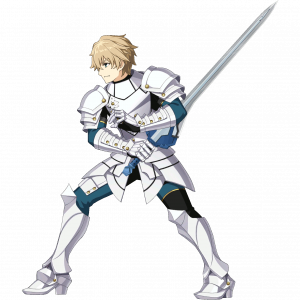 While the king and her sword receive the divine protection of the moon, Gawain and this sword receive the grace of the sun. A knight in shining armor. A perfect gentleman with a perfect smile. Despite his serious character, he has no gloomy aspects and treats everyone with honesty and sincerity. He gets enraged from time to time but since he never holds any negative emotion such as hatred or jealousy, his attitude is refreshing no matter which battlefield he is on. According to other knights of the Round Table, "it's almost a talent to be as likeable as him." Because of his good heart and natural airheadedness, people could never bring themselves to envy him despite his being blessed with both unparalleled talents and a good family. He's a loyal knight, and his loyalty to the king is strong as iron. 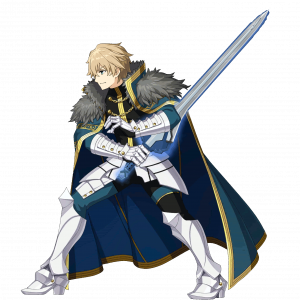 To Gawain, his only wish is to become a sword for the king, to serve for the king. For those who does not know his true nature, they might mistaken his loyalty as blind faith. In the 3 hours between 9 AM and noon, and in the 3 hours from 3 PM until dusk, his strength triples. This skill is the manifestation of "3", a Celtic holy number. One of the Knights of the Round Table from Arthurian legends. 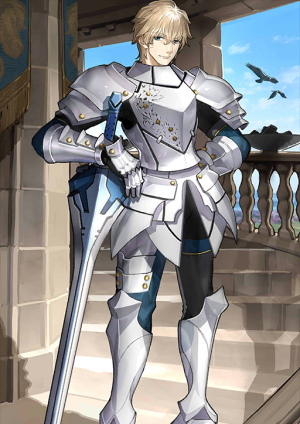 One of the longest-serving knights, a devoted knight who served until the conclusion of the king's fight. 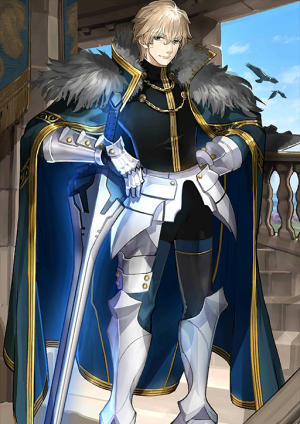 Possessing the holy sword of the sun, said to be Excalibur's sister-sword, he won fame as a peerless knight who was unmatched during daytime thanks to the blessings of a saint. He earnestly performs all sorts of work. Even if that is, by any chance, debt collecting. The sword of the sun that has an artificial sun stored in its hilt. Just like the "Sword of Promised Victory" that King Arthur possesses, this is its sister-sword that was brought about the fairy, "Lady of the Lake". While the king and her sword receive the divine protection of the moon, he and this sword receive the grace of the sun. A prince charming with a gentle smile to match. Despite his serious character, he has no gloomy aspects and interacts with anyone in a sincere and polite fashion. While he may get enraged, since he never harbors negative emotions such as jealousy and malice, his attitude is refreshing no matter what kind of battlefield. According to the other Knights of the Round Table: "That lack of sarcasm is already a talent". 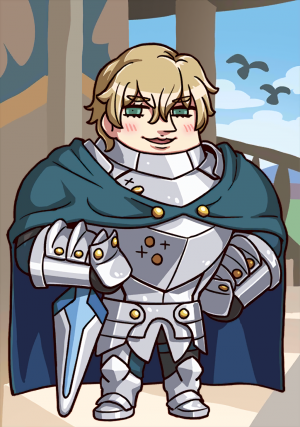 For Gawain to have never been envied, despite blessed with talent and pedigree, was probably due his own good character and the natural airheadness to think of it as a matter of course, without ever being boastful. A loyal knight, his faithfulness to the king was like iron. 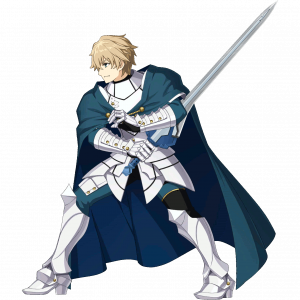 Gawain himself wishes for nothing but to be a single sword for the king's sake. 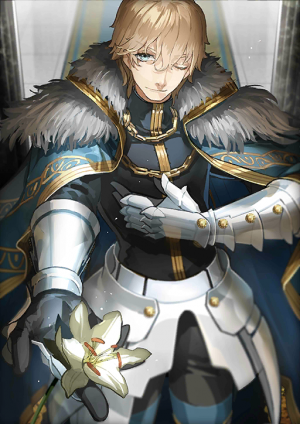 A special constitution that Sir Gawain possesses. His power becomes three times greater only in the three hours between 9 AM and noon, 3 PM and sunset. It indicates 3 as the sacred number of the Celts. This page was last modified on 3 February 2019, at 16:58.